A brand perception tool that makes sense of images, video and text at scale and in real time. A live, deliverable and visual product with adjustable parameters which can analyse tens of thousands of data points instantly. 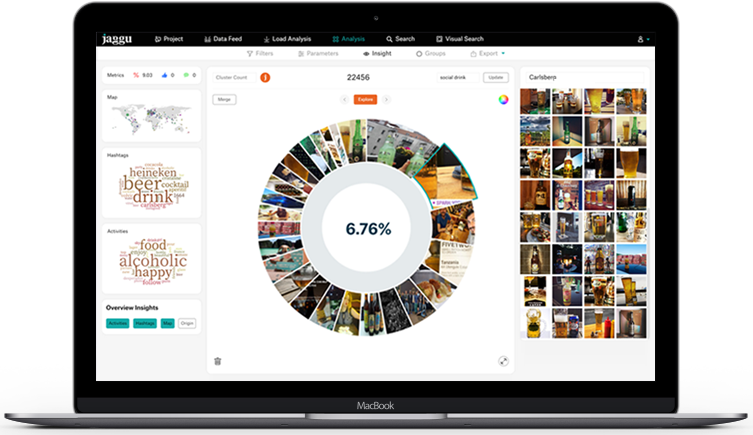 Using a combo of machine learning, image recognition, semiotic analysis and user generated content, we help marketers find out who their customers actually are. A global skincare brand’s most recent North American campaign ‘Face Anything’ is based on Jaggu Social’s insights about femininity and beauty. In just a few days, we were able to hand them data analysis that confirmed a link between female self-empowerment and the ownership of difference. By making these marketing insights immediate , our data became the inspiration for and not confirmation of their marketing strategy- propelling their creative designs in the right direction from the outset.